Abstract. The reachability semantics for Petri nets can be studied using open Petri nets. For us an ‘open’ Petri net is one with certain places designated as inputs and outputs via a cospan of sets. We can compose open Petri nets by gluing the outputs of one to the inputs of another. Open Petri nets can be treated as morphisms of a category, which becomes symmetric monoidal under disjoint union. 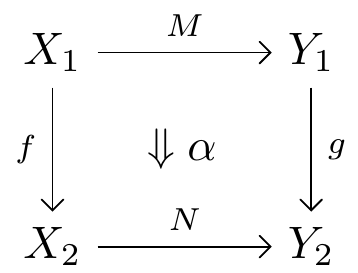 However, since the composite of open Petri nets is defined only up to isomorphism, it is better to treat them as morphisms of a symmetric monoidal double category Various choices of semantics for open Petri nets can be described using symmetric monoidal double functors out of Here we describe the reachability semantics, which assigns to each open Petri net the relation saying which markings of the outputs can be obtained from a given marking of the inputs via a sequence of transitions. 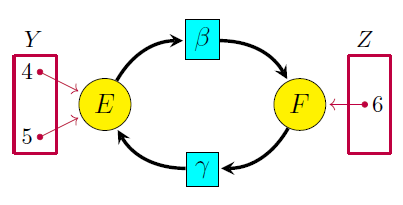 We show this semantics gives a symmetric monoidal lax double functor from to the double category of relations. A key step in the proof is to treat Petri nets as presentations of symmetric monoidal categories; for this we use the work of Meseguer, Montanari, Sassone and others. Petri nets are widely used to model open systems in subjects ranging from computer science to chemistry. There are various kinds of Petri net, and various ways to make them ‘open’, and my paper with Jade only handles the simplest. But our techniques are flexible, so they can be generalized. The yellow circles are called ‘places’ (or in chemistry, ‘species’). The aqua rectangles are called ‘transitions’ (or in chemistry, ‘reactions’). There can in general be lots of places and lots of transitions. The bold arrows from places to transitions and from transitions to places complete the structure of a Petri net. There are also arbitrary functions from sets and into the set of places. This makes our Petri net into an ‘open’ Petri net. Formalizing this simple construction leads us into a bit of higher category theory. The process of taking the disjoint union of two sets of places and then quotienting by an equivalence relation is a pushout. Pushouts are defined only up to canonical isomorphism: for example, the place labeled in the last diagram above could equally well have been labeled or This is why to get a category, with composition strictly associative, we need to use isomorphism classes of open Petri nets as morphisms. But there are advantages to avoiding this and working with open Petri nets themselves. Basically, it’s better to work with things than mere isomorphism classes of things! If we do this, we obtain not a category but a bicategory with open Petri nets as morphisms. However, this bicategory is equipped with more structure. Besides composing open Petri nets, we can also ‘tensor’ them via disjoint union: this describes Petri nets being run in parallel rather than in series. The result is a symmetric monoidal bicategory. Unfortunately, the axioms for a symmetric monoidal bicategory are cumbersome to check directly. Double categories turn out to be more convenient. The theory of ‘structured cospans’ gives a systematic way to build symmetric monoidal double categories—Kenny Courser and I are writing a paper on this—and Jade and I use this to construct the symmetric monoidal double category of open Petri nets. • morphisms between open Petri nets as 2-morphisms. mapping both primed and unprimed symbols to unprimed ones. This describes a process of ‘simplifying’ an open Petri net. There are also morphisms that include simple open Petri nets in more complicated ones, etc. This is just the start. Our real goal is to study the semantics of open Petri nets: that is, how they actually describe processes! And for that, we need to think about the free symmetric monoidal category on a Petri net. You can read more about those things in Part 2 and Part 3 of this series. This entry was posted on Wednesday, August 15th, 2018 at 3:24 pm and is filed under computer science, mathematics, networks. You can follow any responses to this entry through the RSS 2.0 feed. You can leave a response, or trackback from your own site. Symmetric monoidal categories give rise to representable multicategories. What do monoidal double categories give rise to? Also, algebras over multicategories give semantics (I think). 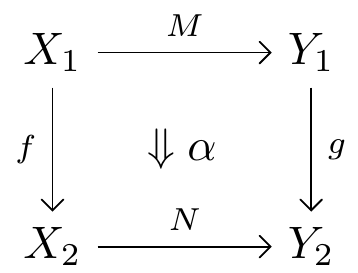 What do algebras over monoidal double categories give you? • nLab, Virtual double categories. I’m not claiming this concept is the answer to your question – it’s certainly not. so virtual double categories are a common generalization of monoidal category, bicategory, double category, and multicategory! Also, algebras over multicategories give semantics (I think). 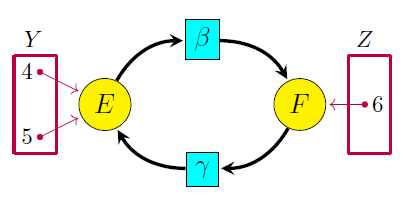 What do algebras over monoidal double categories give you? More semantics. ‘Semantics’ is a very general term for ‘mapping syntactic expressions to their meanings’. Lawvere’s thesis Functorial Semantics showed how to do semantics using maps between categories with finite products. Later people generalized this to all kinds of categories, and in our paper we’re doing it with symmetric monoidal double categories. I saw your paper in the arxiv last night, so that kind of answers my question about semantics in more details. I guess I was too fixated on operads. I think I have an idea of what a double multicategory should be like, and I have a live example or two, which are mentioned in arXiv:1705.04814 [math.OC]. But maybe I am wrong. Does each of your vertical 1-morphisms, ie. function between sets, have a conjoint and companion open Petri net? In other words, do you have a fibrant double category (or an equipment, if you prefer)? This is why I said Mike Shulman’s technique can be applied to get a symmetric monoidal bicategory from the symmetric monoidal double category of open Petri nets. His technique applies to fibrant double categories—or more generally, ‘isofibrant’ ones, where each invertible vertical 1-morphism has a conjoint and a companion. Jade and I don’t actually discuss this isofibrancy, or how to get the symmetric monoidal bicategory. Kenny Courser and I will talk about these things more generally in our paper on structured cospans. The double category is an example of a ‘structured cospan double category’. The idea is that an open Petri net is a cospan of sets where the apex is equipped with extra structure: it’s made into the set of places of a Petri net. Structured cospan double categories are isofibrant under very general conditions! Not sure if this is the right place for it, but in page 20 of your paper, the proof of theorem 18 specifies that and are /linear/ relations, but everything in sight is only a set, not an Abelian group, so I don’t even know what that would mean. Thanks for catching that! Just delete the world “linear”. We took a proof for the double category of linear relations between vector spaces from my paper with Kenny Courser, and adapted it… but failed to purge it of all linearity!